What God Said is a concise text detailing and expanding on precisely what the CWG books tell us we need to know about life and how to live it. It contains a list of the 25 most important messages in the CWG cosmology, with an explanation of what each one means spiritually, metaphysically, psychologically, and practically, as well as my solid suggestions on how one might apply each of the 25 Core Messages in daily life. 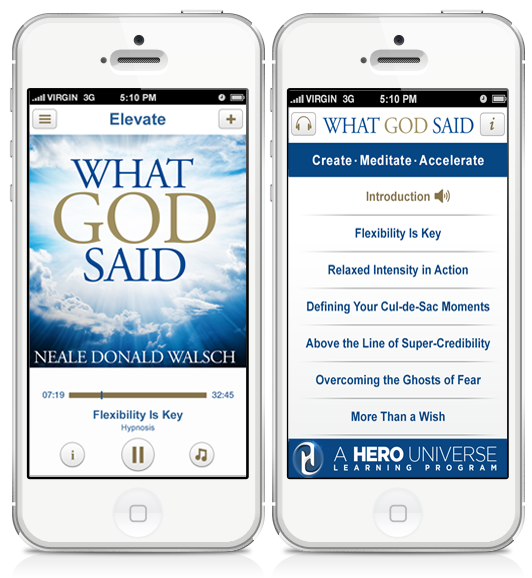 With this 2nd version of the What God Said App - narrated by Neale himself - we’ve broken new ground by creating a short and concise accelerated learning program which focuses on the book's principles, using scientifically-proven methods of condensed knowledge, guided meditation, audio listening and repetition to improve learning. Offering this book in an on-the-go app format makes it easier than ever for people to fit the act of learning timeless principles into their busy schedules. Neale truly believes that, should humanity begin embracing and applying these messages starting today, it can literally change the world. He hopes you will join him in making that happen.